The big question – How much can a ski instructor earn? Ski instructors can expect to earn anywhere from €12 (£11, $14) to €60 (£55, $70) per hour. During the season an instructor could work up to 40 hours a week over 6-7 days during peak weeks, but this could drop down to half as many hours if the school isn’t busy. It is important as a new instructor to be willing to take anything on, and be available if last minute hours do come up, but be prepared if they don’t as well. 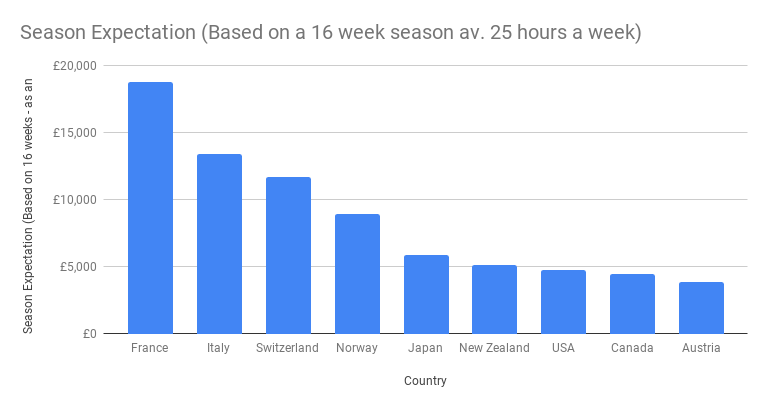 As you can see the wages for ski & snowboard instructors vary wildly across the globe and can vary between resorts and schools in the same country. It is best to select a job based on an opportunity which arises or on where you really want to live, rather than chasing the money. N.B. In Austria, Canada, USA, NZ, and Japan the rates are based on entry level wages, which you can start earning with a Level 2 certificaton. Whereas France, Italy, Switzerland and Norway require more certifications, more training and language developments. The following wages exclude tips and bonuses – Currency conversion based on xe.com Sept 2018. To work in France as a ski or snowboard instructor takes a bit more time and patience than some other routes. But your time will be rewarded with some of the best pay and conditions for instructors in the world with experienced instructors earning €60+. Dave Burrows owner of SnowPros ski school located in the Swiss resort of Chatel told us that the starting wage for a Level 2 qualified instructor starts at around 30CHF (€26) an hour in most resorts. Once you hold a Level 4 ISTD you can expect to earn 50CHF (€44) or more. However, it is worth noting that in bigger resorts wages can be as low as 22CHF (€19) an hour. The answer to “how much can a ski instructor earn in the UK” is not much. UK instructors get one of the lowest salaries in the world. The lowest we have seen is £8.25 per hour but job site indeed.co.uk puts the average at around £10.30 per hour. The need for instructors with Level 3 and above is low and the jobs so rarely advertised it hard to know the exact wage for coaches etc. but we would estimate around £18 ph. 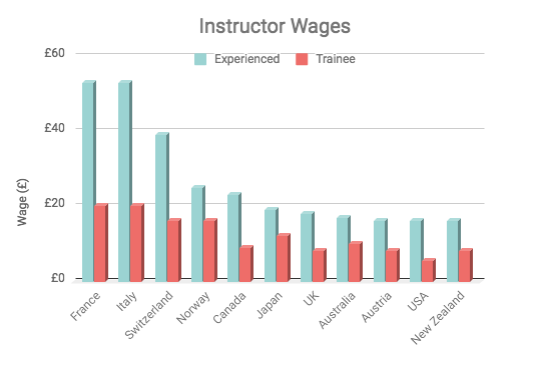 Wages for ski instructors in Italy are similar to those received by instructors in France. Italian Careers advisor Roberto Paolini has done research that suggests that wages start at €30 per hour increasing with experience. And you get called Maestro di Sci. In Austria you often get paid a monthly wage which starts at €875 for a trainee and €1,500 per month for experienced instructors. The Austrian working week is a set 40 hours meaning that even top-level instructors could only earn around €9 per hour. But we have seen evidence that in a big resort and with bonuses the wage can be as high as €18 per hour. Our research suggests that Norway is in the top wage bracket for instructors with wages just below the big payers of France and Switzerland. The wages start low in Canada with jobs listed from a low as 13 CAD but rising to 45 CAD with higher qualifications and experience. Breaking news is that Alberta has just announced a new minimum wage of $15 per hour, so great news for anyone looking to work in Lake Louise or Banff. Check out our apprenticeship opportunity in Lake Louise and work the same season you qualify! 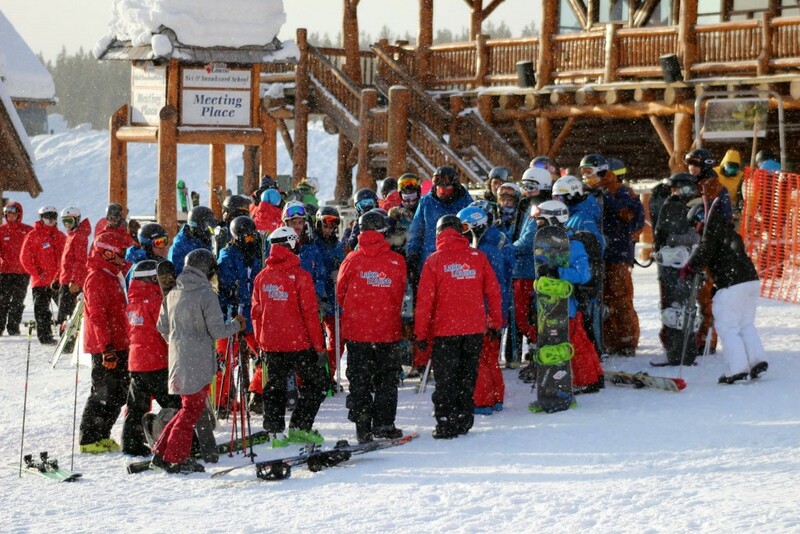 If you are thinking about working as a ski instructor in the USA then you are in luck as 1000’s are advertised every year, from small ski fields to the giants like Aspen. The bad news is that wages are as low as $7.25 per hour with the average around $11.64. It is worth remembering that Americans are notoriously good tippers. This is most definitely a lifestyle job with wages that start at 16NZD which is also the local minimum wage. Some resorts like the popular Mt Ruapehu have a starting wage of 19NZD. It should also be mentioned that New Zealand ski areas are prone to closure due to high winds and it will be in your contract that you will not be paid for these days. Many of the ski instructors recruited to work in Japan are recruited internationally and wages typically start at ¥1700 moving up around ¥400 with experience and qualifications. 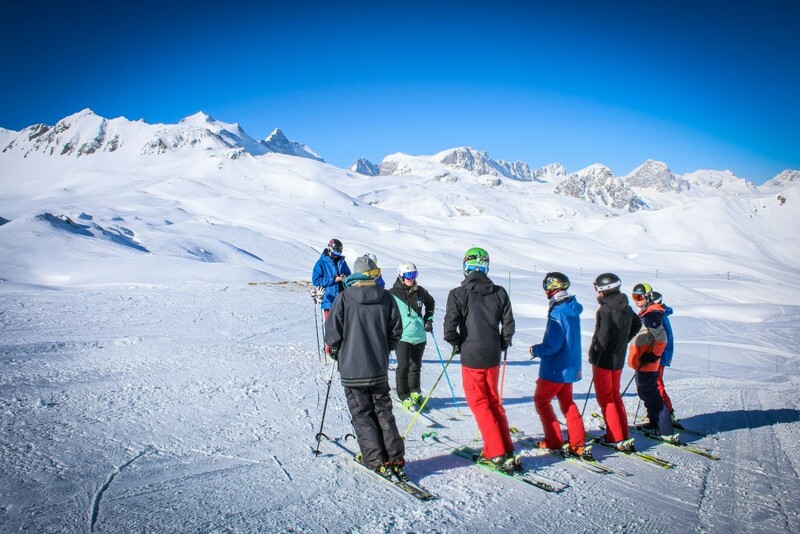 As so many ski instructors are international many ski schools and resorts offer accommodation packages. There are other countries where you can work as an instructor such as Australia, Spain, Andorra, Chile an Argentina where ISIA members can work with ease and the wages start around €15 to €17 per hour moving up to €20 for those holding a higher qualification. This entry was posted in BASI, Life in Ski, Meribel, Mt Ruapehu and tagged canada, employment, gap year, instructor, instructor courses, lakelouise, Ski Instructor Jobs. Bookmark the permalink.